I just gave a great 2 hour interview on Masaki Akaida’s Youtube and Podcast Radio Show Monday July 20, 2015. 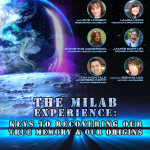 As a reminder we have some new Milab Round Table Participant Panelists to join us Saturday July 25, 2015 6 pm Eastern Time. James Bartley, Tom Montauk and Carissa Conte will join us for this rare and dynamic, controversial subject. We may have some surprise guest “milabs” also. Remember to register at the RISE Multiversity Web site at the link below and give some time to sign in and also download Zoom if you don’t already have it to participate in this video conferencing Discussion Event. This entry was posted in News, Radio and tagged alien abductions, alien love bite, Dark Side of Cupid, Milab Round Table Event, MK-Ultra, Radio Show, trauma by eve. Bookmark the permalink.